A one bedroom studio on a one acre, quiet, country setting close to the ocean. Aloha and welcome to Sandra's Vacation Retreat. A clean and cozy, beautifully decorated studio situated on a quiet, country one acre in the beautiful Puna district south of Hilo. Located in Hawaiian Paradise Park and close to the ocean, this studio has a private entrance and screened-in, private lanai with a gas grill and burner. We are located in a safe and quiet neighborhood only four blocks from the beautiful coast where you can enjoy a walk to and along the ocean; great biking and hiking, and fishing off the nearby cliffs. Come enjoy all that the Big Island has to offer: adventures! Department of Taxation registration number: W01427040-01. Update: as of Feb 1st, the Volcanoes National Park is fully open again to the public. Originally an L.A. girl, I am now a true local Kamaaina woman. I have enjoyed the island life for 23 years in Oahu and now live in my dream destination in the Big Island. Currently, I share this dream and life with Patrick and Kai, our sweet border collie. We enjoy sharing our hospitality retreat and also love hiking, biking, swimming, whale watching and gardening which are some of our favorite activities. Also for the past 16 years I have worked in the spa industry and now I get to share my dream home and my tranquil spa with you. Regarding my spa, I offer special rates for my guests. Services include, facials, waxing and skin care treatments and sessions can be scheduled either prior to, or during your stay. The view of Mauna Kea, the sunrises & sunsets, sounds of the ocean, quiet, safe and private. The sunniest geographical spot in the area, perfect spot for whale watching, space for an orchard, vegetable garden, and collection of exotic plants and trees that I planted with joy. Five blocks to the ocean and walks along the lava cliffs. Great location for seeing all the best sites. One level home with wonderful space. Owners on premises for any questions or help. Newly decorated and fresh and clean. Freshly re-decorated bathroom with large shower enclosure and tile flooring. On a quiet, rural one-acre property, located less than a mile from the ocean. You can hear the ocean and feel the breeze from your retreat! A portable A/C unit is in the apartment. Ceiling fan and large window for ocean breeze. Reading lamp. There is a single gas burner as part of the outdoor grill. There are pots and pans provided for cooking. Offering coffee, tea and basic condiments. Outdoor dining area on the lanai. Nice, large front lawn area. Snorkeling gear, beach towels and beach chairs. I have a spa and offer services which include: facials, waxing and body care treatments. A great gift for special occasions! A session can be scheduled either prior to, or during your stay. A single, fold-out floor futon is available on request. Property is just as you see online. Peaceful, the sounds of wildlife are wonderful and relaxing. Bed is comfortable. Owners have everything you’d need for day trips available. Closest grocery store is 15-20 minutes away, stock up when you see one! Kai, the dog, is a sweetheart🐶. Very clean apartment, all the amenities one could need, located in a quiet neighborhood just a short drive from Hilo. So many nice personalized touches, including snorkeling gear and a binder of must-sees in the area. We enjoyed using the grill to cook dinner out on the lighted lanai! Beautiful place and great hosts, would definitely stay again! My husband and I are considering a big move to the island. Hawaiian Paradise Park is high on our list as an option. This studio retreat is in the HPP neighborhood. It is homey, comfortable, quiet and peaceful. Sandra is a very welcoming host. The bed was so comfortable! It is attached to the home but very much a separate unit nestled in the back. Plenty of room to move about for two people. Well appointed and tidy. We did not have reason to use the air conditioner during our visit but it was nice to know it was there. The ceiling fans kept us cool enough. Maku'u Point is very close to this property and it is a beautiful, breathtaking sight. Lovely, hidden coastal walks close by. Saturdays the Maku'u Farmers Market just down 130 a few miles is very tasty, colorful and fun. Hilo and Pahoa are close by with great sights and places to shop and eat. We were driving distance from a trip to Mauna Kea, Rainbow Falls, Beach Parks and (my favorite) Big Island Candies. It was a wonderful stay with this nice retreat to call "base camp". Sandra and Patrick were wonderful hosts. There was an issue with the apartment we rented but they gave an alternative that was so beautiful and perfect. We really had a wonderful time in Hawaii and would not hesitate on coming back. Thank you for that wonderful stay. When I was looked for a rental, I looked for a place away from the populated areas. Sandra's place was perfect for me and my wife because it's away from downtown and all the crowds. Granted, you do drive farther to tourist destinations, but that the price you pay to have quiet and peaceful time when you're at the rental. The house is surrounded with greenery and tons of singing birds. The place was very clean, organized, spacious, and supplied with little extras for you stay. On a personal note, the washer and dryer was awesome to have because we travel light, so washing is necessary for us and not wear stinky and dirty clothes. I recommend this rental and if I revisit the Hilo again, I will choose Sandra's place to rent again. This place is immaculate and very peaceful! We recommend strongly this place. The proprio is very sympathetic, that is peaceful, easy of access and an cleanliness. All there is it not lack you're welcome. We there retournerions without problem. Thank you sandra for your hospitality! 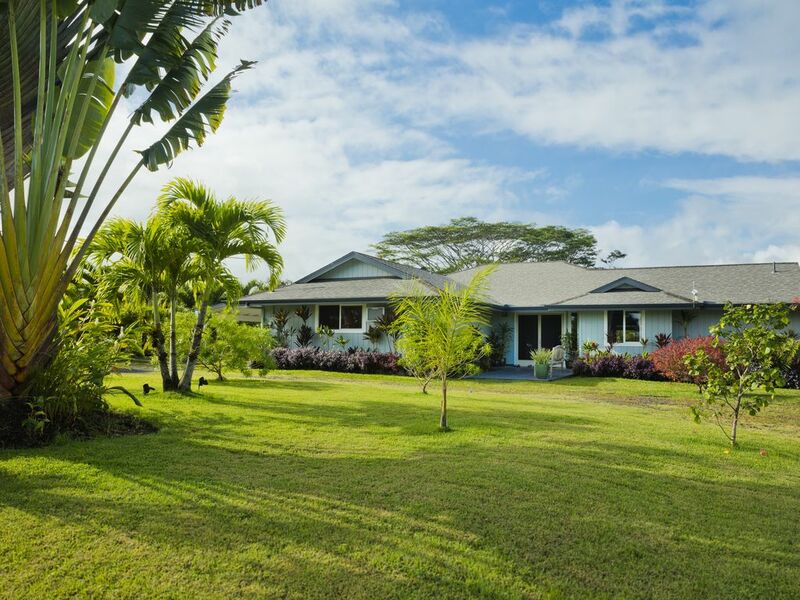 Located in a safe and natural setting, this peaceful retreat offers the sounds and trade winds of the nearby ocean as well as the proximity to the beauty of some of the Big Island's more lovely attractions. Among these, of course, are the Hawaii Volcanoes National Park and the two volcano mountains, Mauna Kea and Mauna Loa, all of which offer unique and unforgettable experiences. Adventures in hiking and biking abound. The drive to Volcanoes Nat'l Park is quite lovely with orchid nurseries along the way. The small village of Volcano is also worth exploring for it's art galleries. Closer by, five minutes away, is the rugged volcanic coastline which offers both beautiful seaside walks as well as seasonal whale-watching. The nearby, charming village of Pahoa offers a quaint glimpse of life into the past. Further north is the town of Hilo with it's own old-world charm, it's bay and it's good variety of dining establishments. Going up the beautiful and scenic Hamakua coast, are the Akaka Falls State Park and the Hawaiian Tropical Botanical Gardens, both of which offer a beautiful and unique experience of the Big Island. -enjoying the many restaurants in the beautiful and quaint towns of Honoka’a, Waimea and Havi.